Three years ago I began “art-ing” chairs to raise funds for Art Center Ukiah, one of the sponsors of a downtown gallery where monthly poetry readings inspired me to begin writing poems again. I love the symbiotic synchronicity of engaging in one artistic form to support another. All my Art Chairs follow an oceanic theme; each chair is created using 100% recycled/reclaimed materials. 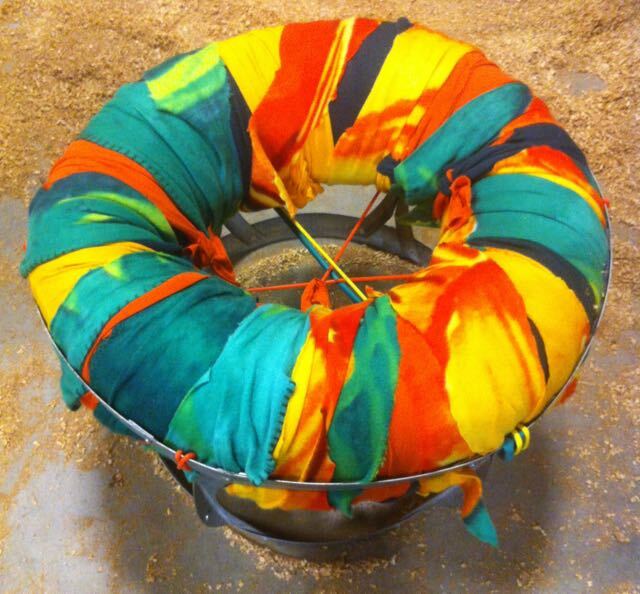 Last year, I designed a circular chair with a metal base and an inner-tube cushion in collaboration with the award-winning furniture-maker Whit McLeod of Healdsburg. The year prior, my “Salmon, Salmon, Salmon!” chair, an abandoned captain’s chair covered with pieces torn from magazines, was collaboratively decoupaged with my Developing Virtual High School students (in separate sessions, both the girls and boys became so deeply engaged in the project I literally had to pry them away from the chair and shoo them out the door to their next class! ), and sponsored by the Salmon Restoration Association. 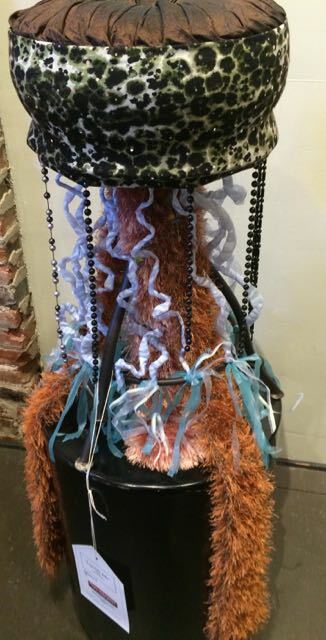 This year, recognizing that our oceans are changing dramatically, I transformed a metal stool found on Craigslist into a jellyfish, using scarves and a cushion from the Salvation Army, beaded necklaces from Goodwill, and earrings from my own collection. The artwork, “Legs Like Jelly,” is on display – and available for purchase in the silent auction – as part of Ukiah Corner Gallery’s Chair Affair at 201 South State Street through June 26th. Several dozen wildly creative, one-of-a-kind arty-chairs are scattered throughout the gallery…and if I could, I’d bid on every single one of them!